Good evening Sens fans! It's Saturday in December, so it's time to light a fire, get some hot cocoa, gather in front of the TV with the family, and soak in a part of our proud Canadian heritage with Ron MacLean, Don Cherry, and the gang on Hockey Night in Canada at 7 PM. Hold on, the game is actually being broadcast on Sportsnet at 2 PM, but what says tradition like an afternoon game against a Southern Californian opponent in the LA Kings? I just got the chills! Speaking of tradition, Paul MacLean decided to start off his morning with his daily breakfast shake-up of the forwards. I've decided the only way to appropriately analyse Paul MacLean's lineups is via random sentence generator. So if you ask me what I think about these lines: Deborah's son doesn't look short. Charlie is helpful. I am a plumber. Marc Methot is still out of the lineup with the flu and Jerry Cowen remains in the Shanaban tank, so emergency call-up teenager/team's most reliable defenceman Cody Ceci stays in the lineup this afternoon. 7:00: Phil Kessel had some time to kill before the Leafs played tonight, so he got in some afternoon glass-banging. Really digging the new look, Phil. It suits you. 7:17: Willie Mitchell drags down Chris Neil, sending the Sens to the power play. On the power play, Spezza makes his patented No Look Drop Pass To Nobody, clearly failing to understand what Paul MacLean meant by "take advantage of all that open ice,"
10:48: Denis Potvin points out the rink is oval. Phaneuf delivering a blind headshot to Phil Kessel. Dion Phaneuf hitting himself in the face with his own stick. 20:00: I ask Chet how he's enjoying his time at the Canadian Tire Centre. "I'm with my Dad and neither of us have spoken in 10 minutes." Time actually slows down during the second period, so I've abandoned using the clock. At some point, Chris Neil tries to get his team going with a scrum after the play. And oh man, did it energize the bench! I photoshopped out the line of saliva dripping from his chin. At some other point, possibly later in the period, Dean Brown uses his excited voice for 2 straight minutes, which almost leads me to believe something is happening. Mika Zibanejad finally blinks. After Gryba is called for high-sticking, a scrum ensues after the play. Thankfully, the gigantic linesman breaks up Chris Neil and Cory Conacher before they do any serious damage to each other. Bryan Murray reportedly made a few calls to see if the gigantic linesman was eligible to play defence. In an intermission interview, Cory Conacher says "2 PM starts are killing us" before adding, "as are other NHL teams" under his breath. Zack Smith almost finishes off a pass in front from Colin Greening, but gets pulled down by Drewfus Doughty. Paul MacLean shakes his power play magic 8 ball, which reads out "SEND A MESSAGE." Greening-Smith-Neil get trotted out on the power play. Hat tip to Andy Warhol for the inspiration. 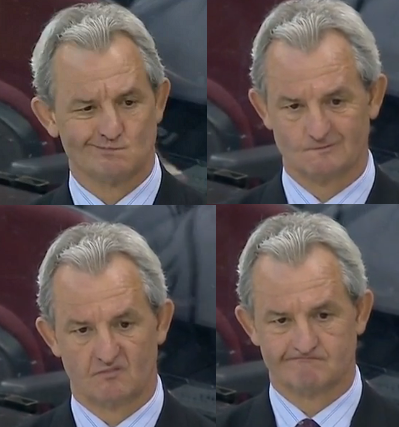 But cheer up Darryl! Things are about to turn around for your club! With 7 minutes to go, Drew Doughty goes coast to coast through the entire Ottawa Senators before being stopped by Lehner. Jarret "Don't Call Me Jared" Stoll knocks in the rebound to make it 4-2 Kings. In the post-game interviews Paul MacLean gave his patented statement of "Erik Karlsson needs to spend more time playing for our team, and less for the other team," before the media informed him that it was in fact Drew Doughty with the end-to-end rush. In what was actually a fairly competitive effort by the Ottawa Senators against a powerhouse opponent in the Kings, I'm going to point my giant blogger foam finger of blame at Paul MacLean. I can cut him some slack for starting Anderson, given that he's still the team's number one goaltender, and the team doesn't completely want to remove him of value before potentially shipping him off at some point in the next year. It's time to run with Lehner for a while. Blue indicates the leading scorer's TOI. 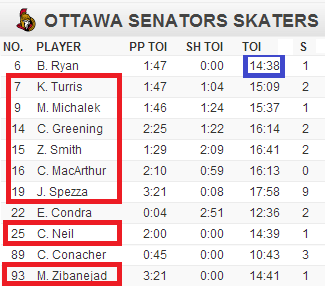 Red indicates players who received more ice time. SensMotB - Dec. 23 vs. Pittsburgh: $2,250 raised!